“Now as to the times and the epochs, brethren, you have no need of anything to be written to you. For you yourselves know full well that the day of the Lord will come just like a thief in the night. While they are saying, ‘Peace and safety!’ then destruction will come upon them suddenly like labor pains upon a woman with child, and they will not escape. But you, brethren, are not in darkness, that the day would overtake you like a thief; for you are all sons of light and sons of day. We are not of night nor of darkness; so then let us not sleep as others do, but let us be alert and sober. “For God has not destined us for wrath, but for obtaining salvation through our Lord Jesus Christ, who died for us, so that whether we are awake or asleep, we will live together with Him. Therefore encourage one another and build up one another, just as you also are doing. 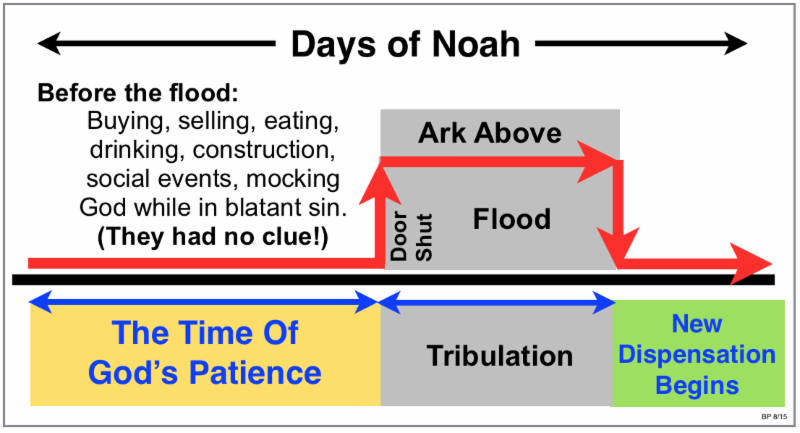 Noah on the Ark is a picture of the Church being taken up and over the tribulation. Lot is a picture of the Jews being removed to safety, protected and away from the destruction (in Petra?) during the Tribulation. Paul gives us the picture of tribulation as a thief coming in the night … but coming only for unbelievers. The thief won’t be coming for Believers as we should be well aware of what’s coming–the mass removal of the Church. And this should be “encouraging” to us!